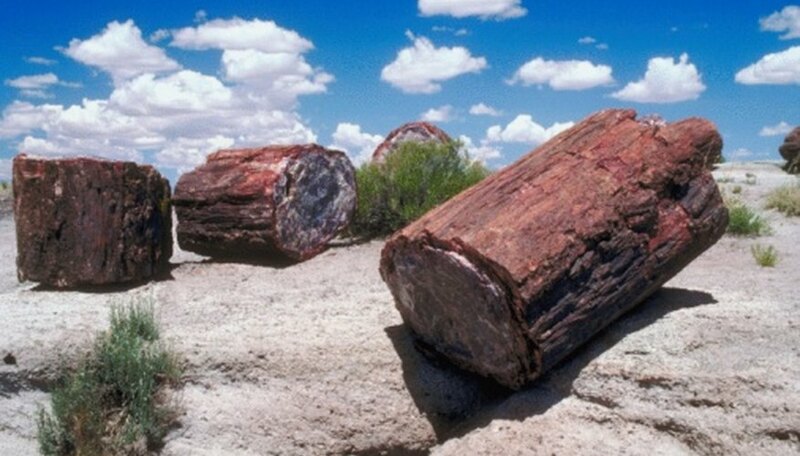 Petrified wood is a common fossil found in abundance in some areas. The fossilization process called permineralization fills in the natural pores of wood with minerals such as opal agate and quartz and leaves wood petrified, which means turned into stone. You can easily slice some of your petrified wood into slabs to see the internal beauty of both the original wood structure and its mineral alteration. Your slices of petrified wood will look great on display in a collection while serving as objects for further study. They make great gifts and souvenirs of your paleontology adventure as well. Obtain a piece of petrified wood that you would like to slice into slabs. Select a piece that is not quite as thick as the exposed radius of the blade of your wet saw. You may have to obtain a wet saw with a larger blade radius to cut larger pieces of petrified wood. Be certain that your wet saw has sufficient water flow to keep your work lubricated while you are cutting your petrified wood into slabs. Follow the directions and safety recommendations in the instruction manual for your wet saw. Use a fence guide for your wet saw to keep the thickness of the slabs you are slicing uniform. Set the fence guide to the desired thickness of your slabs. If your wet saw does not have a fence guide, you can make one with a short piece of scrap lumber and a pair of clamps; or you can do your slicing "by eye" and hope for uniform thickness in your slices. Apply firm and uniform pressure to the rock as you pass it through the blade of the wet saw. Set your slices aside as you continue slicing through the remainder of your piece of petrified wood. Wash your finished slices of petrified wood in soapy water and rinse with clean water. You can polish your rock slices by ordinary lapidary processes later. Use your fingertips to rub in a spot of liquid dish soap onto the flat smooth surfaces of your petrified wood slabs to bring out the sparkle of the minerals and the detail of the wood until you are ready to permanently polish them later on. The art and science of cutting and polishing rocks is called lapidary. This also includes tumbling stones in a rock tumbler with decreasing sizes of grit until they are smooth and shiny. Learn the art of polishing rocks. To bring out detail, polish flat slabs of rock on pieces of plate glass using decreasing sizes of polishing grit until slab surfaces are smooth and shiny. In the absence of polishing equipment, rub rock surfaces with dish soap, rub with oil, or coat with clear polyurethane to help bring out the beauty and detail of sliced rock slabs for display. Your local monument company (gravestone and headstone artisans) may be able to help you with cutting and polishing rocks as well. Be sure you have permission from the landowner before entering any land to hunt for rocks, fossils or petrified wood. Be aware of any state laws and pounds-per-day limits for collecting petrified wood. Do not remove anything from national parks or state parks. Petrified Forest National Park uses video surveillance and law enforcement to protect our petrified wood national treasures. Use caution safety glasses and adult supervision of children when using power tools such as wet saws. Steven J. Wamback is a natural resources scientist, writer and editor. He holds a Bachelor of Science in biology and a Bachelor of Arts in geology, both from SUNY Fredonia. Wamback's writings and editorial projects include books, chapters, articles, essays, editorials, reports and research publications on such diverse topics as wetlands, wildlife, groundwater, rocks, fossils, sexuality, health, the environment and radio-wave propagation. J., Steven. "How to Slice Petrified Wood Into Slabs." Sciencing, https://sciencing.com/slice-petrified-wood-slabs-8622274.html. 25 April 2017.